Hello dear friends! I’m really excited about this blog post! 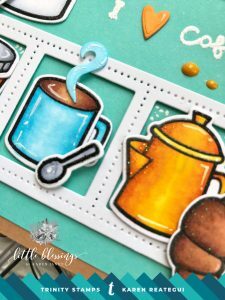 I’m on the Trinity Stamps blog today using the Coffee With Character Stamp & Die and the Caffeinated Sentiments. I loved coloring and adding some texture to the images. Also, you can personalize and play with each image, you have plenty of options to create wonderful cards. Let’s begin! I started by stamping all images with Versafine Onyx Black ink and clear heat embossed with Hero Arts embossing powder. Then, I had a fun time coloring each image with Copic markers. I used many colors and all of them in shades of orange, pool and brown colors. When I finished coloring, I die cut all the images using the matching dies. Also, I added details with a white gel pen and some texture to croissant and the donut, using Sticky Powder from Ranger and Flocking Powder by Martha Stewart. This flocking powder adds a very interesting texture, which feels very smooth when you touch it. 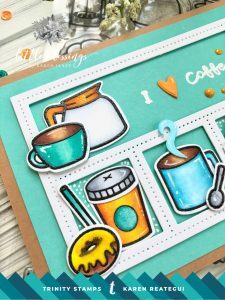 Next, I die cut a 4-window frame die (you can use any window frame die or shape you may have) out of white cardstock and placed it on top of a pool A2 cardstock by Hero Arts. I arranged all my images around the window frame. 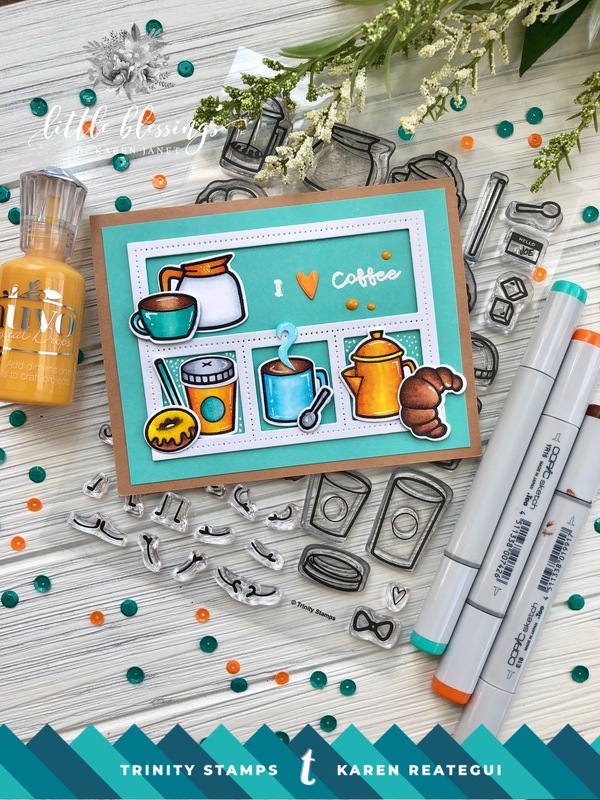 Additionally, I stamped my sentiment with Versamark and heat embossed it with White Embossing Powder from Hero Arts, plus I die cut an orange heart and added it next to the sentiment. Finally, I placed my panel on top of a kraft card base and added some English Mustard Nuvo Crystal Drops. I really hope you enjoyed this fun card. 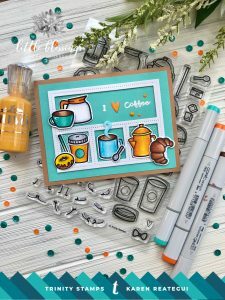 The Coffee With Character Stamp & Die and the Caffeinated Sentiments are on stock on Trinity Stamps website, go get you set and have lots of fun creating. 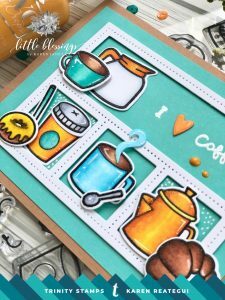 Also visit Trinity Stamps Blog for more inspiration and ideas. Have a blessed day! Succulent Banner: One Stamp, Three Ways with Designer Emily!